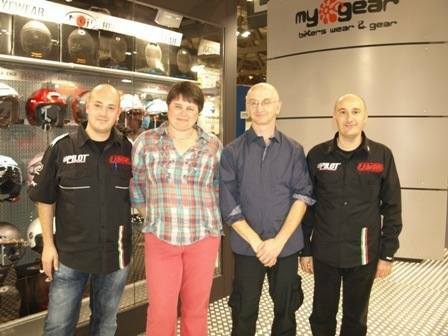 Background history of Securit GB Ltd & Shop4bikers. Shop4bikers.co.uk is run by Securit GB Ltd . In August 2004 we successfully launched Securit (GB) Ltd, manufacturing motorcycle garages and retailing a small range of motorcycle accessories. The company has gone from strength to strength over the last 7 years, with a highlight being receiving a Barclays Bank award as a national finalist in the Trading Places competition. With the accessories side of the business rapidly increasing, we noticed that our customers were constantly complaining that the accessory market in the UK had become stagnant and boring with most retailers only selling the same items. We therefore decided to do something about it and embarked on an exciting new project, Shop4bikers. We visited the Milan Motorcycle show in 2009 to try and find new products different enough to what was available in the UK.We came across an Italian company called LAMPA (www.lampa.it) .Their ideas were the same as ours, to offer quality, affordable but innovative products. We are now the UK distributors for Lampa motorcycle products. Locate Shop4bikers (Securit GB Ltd) using the Google maps. © Copyright shop4bikers 2019. All Rights Reserved.